Disclaimer – I spent a few years as a soldier in the Canadian Scottish Regiment. I did my basic training and participated in the regular parades and exercises, but never served on a mission. That said, my view of war and soldiers is coloured by that as well as some family history in the military, so take it for what it’s worth. 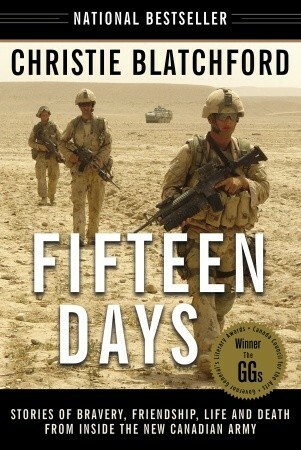 Fifteen D ays is a collection of stories from author Christie Blatchford’s several trips to Afghanistan with the Canadian Forces in and around 2006. Blatchford’s stories primarily revolve around her experiences with the PPCLI’s first rotation into Kandahar as part of Operation Archer. While mostly under NATO command, the Canadian contingent numbered up to 2,300 personnel, commanded a multinational brigade and had a much larger degree of autonomy than in past missions. Blatchford was embedded with the troops and so provides a close perspective on the realities they face. She paints clear pictures of the way the troops lived, the challenges they faced, and the emotions they dealt with on a daily basis. Eventually however, Blatchford’s format becomes familiar. Many of the chapters follow the same structure – an introduction of a soldier and his friends, generally through some form of action. Then we meet the loving parents who were concerned about their child joining the military, yet amazed by how they grew through it. We also meet the young wife fresh and expectant mother who had her concerns, but loved her husband and supported him fully. Back in Afghanistan we read Blatchford’s descriptions of a fight – almost invariably the hero is killed, despite superhuman efforts by medics, squad-mates and ambulance or helicopter crews. Those same people share their thoughts on how they handled his death, and we return to the family to share their grief. Blatchford excels in bringing out how small the Canadian Army is and aptly details the large amount of work they do. Many names are seen across multiple stories, playing different roles to different people. The White School, Patrol Base Wilson, and other locations become as well known to the reader as they were to the troops. The final chapter was by far the most interesting. Here Blatchford fully breaks format and follows several groups of soldiers as they return to Canada and learn how to return to garrison and family life, while remembering and respecting their fallen comrades. I was touched by the near universal willingness of parents of the fallen to invite their child’s friends into their house to grieve and laugh together. I also appreciated Blatchford’s willingness to touch on harder subjects such as the apparent automatic diagnosis of Post-Traumatic Stress Disorder of the first returning soldiers, and the politically correct line that ‘war is all horror and no one who has experienced it would ever want to revisit it,’ borne false by the many soldiers who volunteered for additional tours. While the stories can feel a bit repetitive, Blatchford is a skilled writer, picking out key details to describe emotional moments and capturing the feel of a firefight without having to describe it blow by blow. Combined with the distinctly Canadian perspective, I would definitely suggest this for anyone looking for a more personal look at the soldiers who fought and died for us in Afghanistan. This entry was posted in Muse Reviews and tagged Afghanistan, Book Review, Canada, Canadian Forces, muse reviews, soldiers. Bookmark the permalink.